The Flying Tiger Line founder, Robert (Bob) W. Prescott and other young pilots joined General Claire Chennault and the famed Flying Tigers in China during WWII. Eleven members of the AVE joined Prescott and formed the National Skyways Freight Corp. 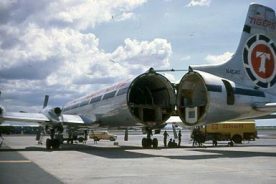 The first all-cargo airline in the country was born on June 25, 1945, based in a two-car garage in Long Beach, California and flying Budd Conestogas. The first full shipment consisted of grapes flown from Bakersfield, California to Atlanta, Georgia. In January 1946, the airline moved to Mines Field (later to become Los Angeles International Airport). In June 1946, the Budd Conestogas were replaced by C-47s. In December 1946, Flying Tigers received its first Transpacific Military Contract, flying C-54s to Tokyo and Hawaii. Also in 1946, Flying Tigers moved from Mines Field to the Lockheed Air Terminal in Burbank, California. 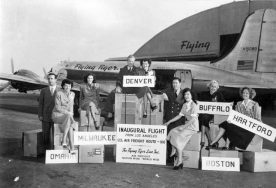 In February 1947, the airline legally changed its name to “The Flying Tiger Line, Inc.
“Elsie the Cow” was one of the airline’s first celebrities when the Borden Company chartered a plane especially equipped for the bovine for a one-month tour. In 1948, the “Anything, Anytime, Anywhere” slogan was introduced – and the airline carried football teams, Bob Hope’s record albums, tourists, students, and even Roy Rogers horse, Trigger. 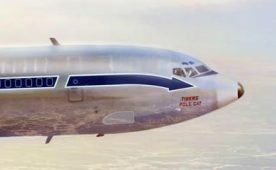 In April of 1949, after a four-year battle, the company was awarded CAB (Civil Aeronautics Board now FAA) certification and established the FIRST ALL-CARGO Scheduled Route 100 from Los Angeles to Boston with points in between. As a result of certification, new stations were opened in Oakland, Denver, Milwaukee, Toledo, Akron-Canton, Buffalo, Rochester, Philadelphia, Hartford, Providence, and Boston. Flying Tigers already had terminals at San Francisco, Burbank, San Diego, Chicago, Cleveland and Newark. During 1949, the C-47s were replaced with the C-46s, which had a higher payload and longer range. The C-46s flew the domestic operation while the C-54s remained in overseas charter service. 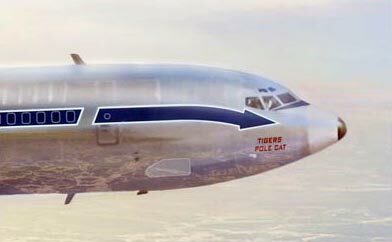 Early in 1961, the first of the Canadair CL-44 all-cargo aircraft joined the flying Tiger Fleet. The “Swingtails” were so nicknamed because their tails literally swung away from the aircraft for loading. 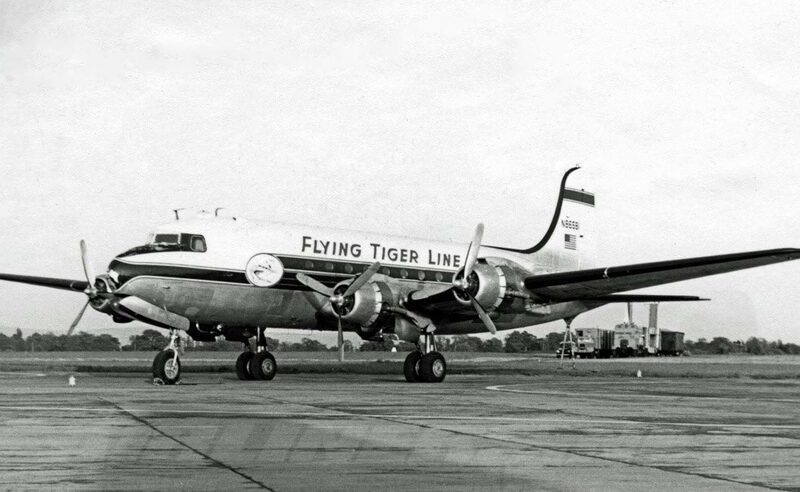 The CL-44s moved Tigers into leadership as the world’s largest freight and contract airline. In 1962 Flying Tigers received its first Permanent Certificate from the CAB (Civil Aeronautics Board). Also in 1962, the company initiated the first coordinated combination of sea and air transportation; later to become known as SeaTiger. In 1963, Air Cargo Operations moved back to the Los Angeles International Airport. In 1964, the company graduated its first class of flight attendants. That same year, ground-breaking ceremonies took place for the company’s World Headquarters at Los Angeles International Airport. 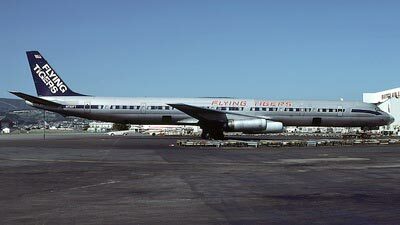 In 1965, the company received two Boeing 707-320C freighters and became part of the jet age. The Flying Tigers Flight Training Center opened in 1968 at the Los Angeles International Airport. 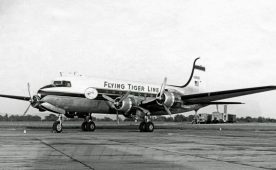 The Flying Tigers Boeing 707 POLECAT established speed and distance records on its pole-to-pole flight around the world. On March 6, 1967, Flying Tigers’ first DC8-63F aircraft arrived. Flying Tigers received the All-Cargo Route #163 across the Pacific into Asia. During 1969, the CL-44s and B707s left the fleet as the addition of DC-8s took their place. Flying Tigers continued to fly military troops and cargo into Vietnam during the war years. The company’s participation in the Peruvian Airlift aided earthquake victims in the quake devastated country. 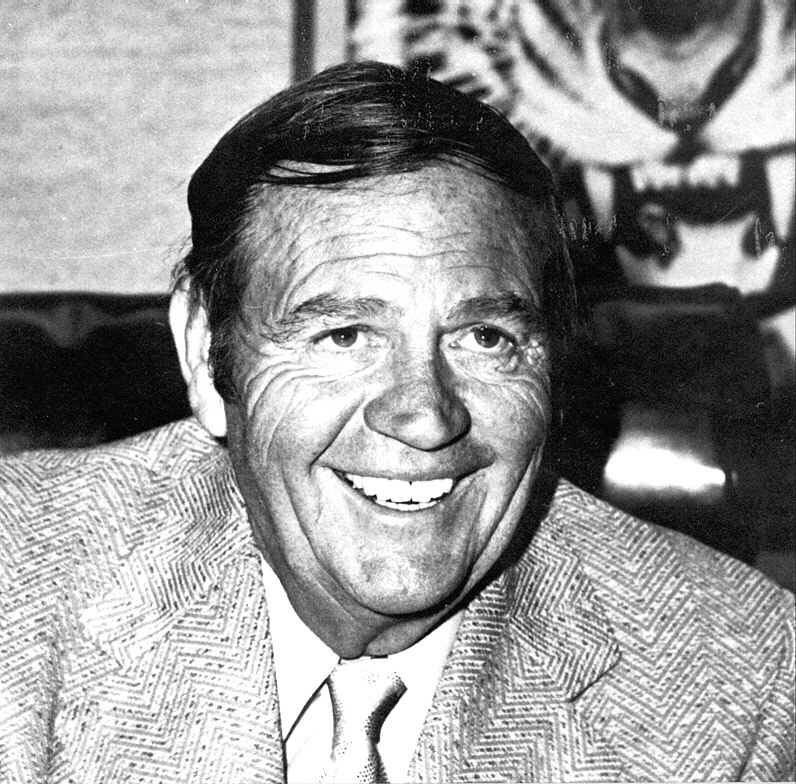 On June 12, 1970, the Peter Prescott Hospital for children in Taiwan was dedicated in honor of the founder’s son, who had been killed in an aircraft accident in Palm Springs. In 1975, the airline published the “Airfreight Guide for Hazardous Materials,” and quickly became a leader in the education and transportation of dangerous goods throughout the world. The first direct food and medical supplies from the United States to Phnom Penh was transported by Flying Tigers on Thanksgiving Day, 1979. Tigers flew 176 missions to Phnom Penh providing 17 million pounds of rice to the besieged city. In April of ’75, with the collapse of the South Vietnamese government, Flying Tigers evacuated its own personnel and other refugees from Saigon. 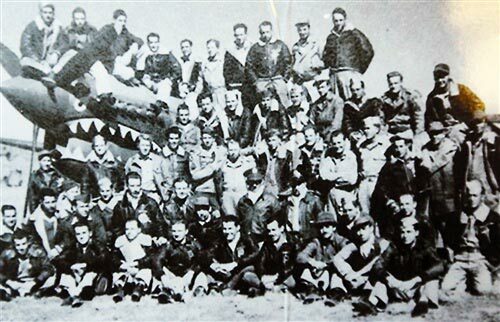 Many of these people became valuable members of the Flying Tigers family. Shamu the whale took a first ride on Flying Tigers. On November 9, 1977, President Carter signed into law the legislation which deregulated airfreight in the U.S.
On March 3, 1978, one month after Flying Tigers was named the largest airfreight carrier in the free world, the airline’s founder, Robert W. Prescott, died. On November 2, 1979, the company received its first Boeing 747-200 freighter. 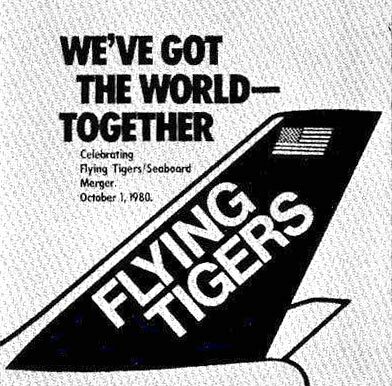 On October 1, 1980 Flying Tigers merged with Seaboard World linking the United States with Europe and the Middle East. 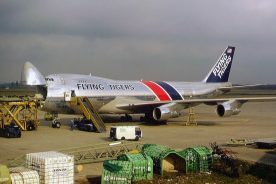 The merger gave the combined airlines scheduled, all-cargo services world-wide. On July 31, 1982, Flying Tigers began regularly scheduled jetfreighter service between the United States and Sao Paulo, Brazil, to become the only all-cargo carrier connecting South America with a service network that stretched thought out Asia, Europe and North America. 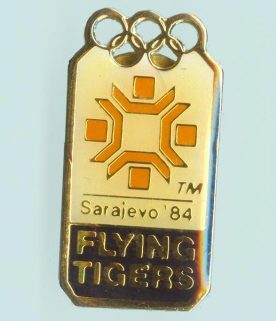 In 1982, Flying Tigers flew relief flights to Warsaw, Poland. Medical suplies and staples were aboard the first airlift of relief supplies to reach Poland since the imposition of martial law in November of the previous year. On September 3, 1983, Flying Tigers inaugurated scheduled B-747 service to Australia. In 1984 the DC-8-63s were phased out as a result of Federal noise regulations that went into effect that year. 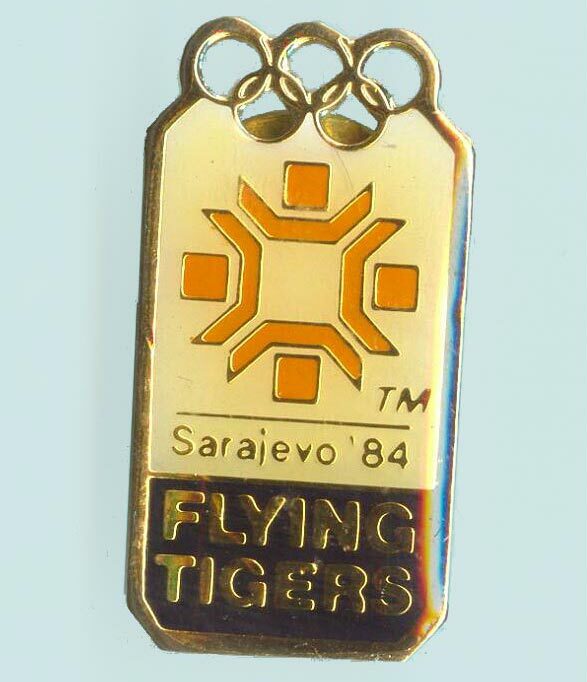 Flying Tigers sponsored the 1984 Winter Olympics in Sarajevo, Yugoslavia and transported equipment for the games. The airline’s first B-727s were placed in service in early 1984. The Statue of Liberty torch flew on Flying Tigers. This historic symbol was moved from Ellis Island in New York Harbor to Los Angeles for the Annual Rose Parade in Pasadena on January 1, 1985. January 29, 1985, was the first of two “lifelift” flights for Ethiopian Relief that brought food and medical supplies to the starving inhabitants of that country. It was an effort conceived and accomplished by Flying Tigers employees throughout the company’s world-wide system. On March 3, 1986, operations commenced in the new Columbus, Ohio Hub at Rickenbacker Air National Guard Base. 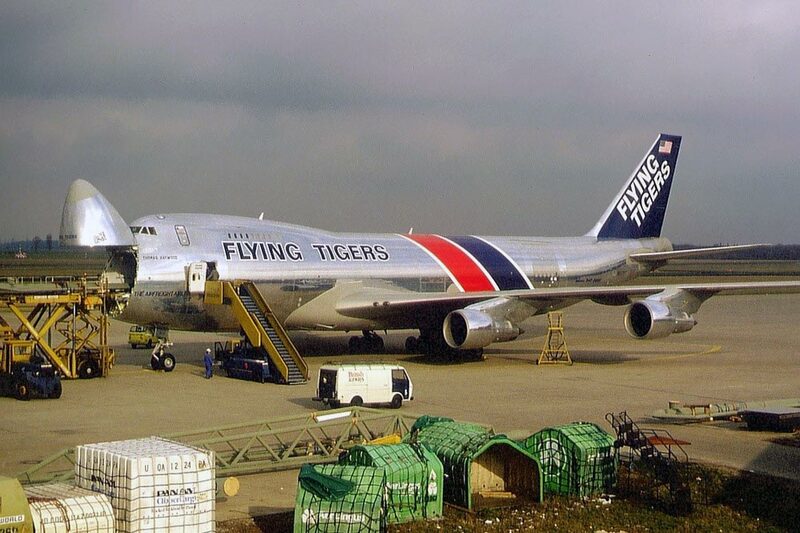 In August ’87, the newly re-engined DC8-73DF freighter came online with the Tiger fleet of B-747s and B-727s. 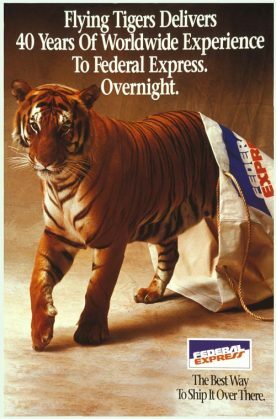 On December 16, 1988, Federal Express announced their cash tender offer for the purchase of Flying Tigers. August 7, 1989 was the official merger date of Flying Tiger and Federal Express.